This is the de facto national pickle of Korea, and a quintessential kimchi. For me, it is purgatory to eat fried rice or any kind of stir-fry without it. A couple of notes here: it’s easy to make a double batch of the red sauce and save half in the fridge for the next time you make kimchi; it will last for months. Kitchen shears, and not a knife and cutting board, are the best way trim your pickled cabbage quarters down to a manageable size without letting that intoxicating liquor from the cabbage that gives it juice and flavor ooze out. And if the extra step of cooking and blending the sauce is too much work, I have a quick kimchi recipe in my book Jam It, Pickle It, Cure It (but this is a much richer kimchi experience). Discard the tough outer leaves of the cabbage(s); we’re going to quarter the cabbage lengthwise. Cut the cabbage in half lengthwise just through the base, then pull apart the upper portion of two halves with your hands. Cut the halves in half again at the base, pulling the quarters apart with your hands. You should have 4 to 8 long quarters of cabbage, depending on how many heads you started with. Measure the salt into a small dish and, working with one section of cabbage at a time, lightly sprinkle salt between the leaves, beginning with the bottom, outermost leaves. Concentrate more salt on the stem end than on the green leaves. 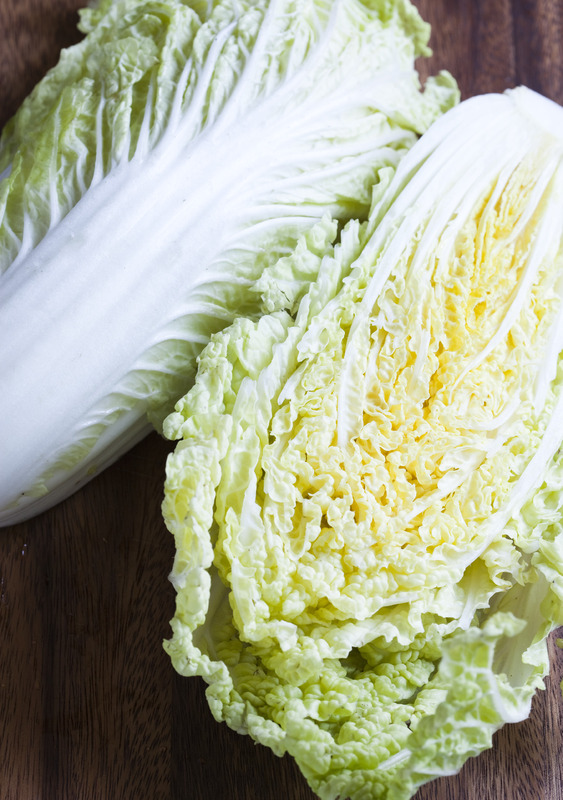 As you finish salting the cabbage chunks, line them up “head to toe,” cut side up, in a 9 by 13-inch baking dish. Pack them snugly; if they don’t all fit, you can, for now, let a couple of the quarters rest on top of the others. Cover the cabbage with a board or large drop lid  and weight it with 5 pounds. After 30 minutes, flip all the pieces over so they are cut side down, replace the board and the weight, and let them sit another 30 minutes. Meanwhile, make the sauce. In a small saucepan over high heat, bring the water to a boil. Whisk in the flour and lower the heat to a simmer, stirring constantly for 1 to 2 minutes to smooth out and thicken the mixture. Turn off the heat completely, and while the slurry is still warm, add the gochujang, sugar, and chile flakes, whisking to combine. In the work bowl of a food processor fitted with a metal blade, mince the garlic and the ginger until they are as finely chopped as your machine can get them—the vegetables will stop whirling around the bowl. Add the cooked flour mixture to the work bowl along with the fish sauce and process until fully smooth, about 1 minute. Uncover the salted cabbage and hold each quarter up by its root end over the dish. Squeeze out excess moisture with your hands and lay the drained cabbage quarters on a plate. Pour out whatever liquid has puddled in the bottom of the dish—don’t be concerned if there’s not a ton of liquid. Then, working with one cabbage section at a time, spoon about 1 to 1½ teaspoons of the sauce between each cabbage leaf, starting with the bottom outside leaves and working your way in toward the smaller, inside leaves. Don’t worry if the sauce does not fully coat the leafy tops yet. Return the cabbage to the baking dish, packing the quarters in “head to toe” once again, this time stuffing all of the cabbage (now much more flexible) into the dish. Once all of the inside leaves have been covered, scrape the remaining sauce over the top of the cabbage. Use your hands to work the sauce into the top of the leaves of the cabbage, and roll the cabbage around to fully coat it on all sides. Place a layer of plastic wrap directly, but loosely, on top of the kimchi, leaving room for air to come in along the sides. Place the board back in place on top, and weight again with 5 pounds. Cover the whole assemblage loosely with a clean kitchen towel to keep out insects and debris but let air flow in. Let the cabbage rest, weighted, in a cool, dark place for 4 to 6 days, until it takes on a pleasantly fermented odor. Don’t worry if you see liquid pooling in the bottom; this is part of the transformation. Once it’s fermented to your liking, your kimchi is ready to eat. You can cut up one cabbage section at a time to serve it in smaller pieces, or simply trim off and discard the root ends for longer pieces. 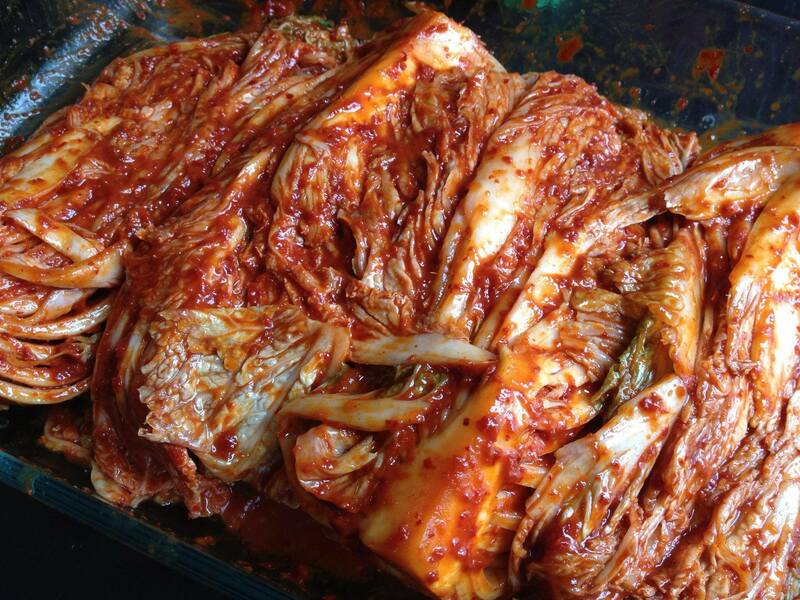 Pack the kimchi tightly into an airtight container and refrigerate. It can be eaten raw for at least 6 weeks, and then used for cooking for at least another 6 weeks.